Beyond more ordinary offerings, these Chocolate Truffle Hearts Highlight Valentine’s Day in an upscale way. Packaging is of a higher quality, ribbon tied, with heart-shaped tag … easily removed to insure the gift is not commercial in appliance when given. Know that this display and packaging outshone other temporary point-of-purchase constructions throughout this store. Good job Dove. 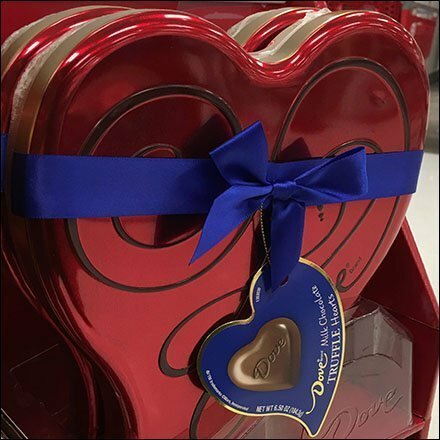 These Chocolate Truffle Hearts Highlight Valentine’s Day selections seen at Target. “Candy Store Fixtures Pinterest Board“ for a visual summary. “Candy Store Fixtures Index Page” for all resources and links. “Mated Trays Pinterest Board“ for a visual summary.